Acer palmatum ‘Hefner’s Red’ is an upright Japanese maple similar to and, according to some, superior to Bloodgood. It’s a compact grower, comes out in the spring with vibrant red leaves and turns to a very deep red as summer approaches. Hefner’s Red does a great job of holding that deep red color right into the fall and even holds it’s color when shaded. Hefner’s Red Japanese Maple only gets ten to twelve feet high and, as with all small trees, it can be kept trimmed to a lower height if that’s what you need. I bought, what I was told is a Hefners Red Maple. However after reading your description, I’m not sure that is what I have. I had expected it to stay some shade of red all summer, but it is more green than anything and is somewhat mottled in color. Is there anything I am doing to cause this? It gets mostly sun throughout the day, I have kept it watered. It was a sizeable tree when I planted it. Probably about 5 feet and about a 5 feet spread. I planted it in the spring when it was red but now in the summer it is mostly green. the new leaves come out red and then turn green. I need advice and information. I paid a lot for the tree!!!! I really don’t think you are doing anything wrong and I won’t say that your tree is not what it is supposed to be. I really have no idea. 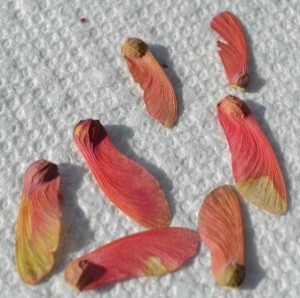 Some red Japanese maples will turn green in the summer, I guess it just depends on how red. Wish I could offer more. I’d do more research because I’ve not really grown one out to any size that I can recall. 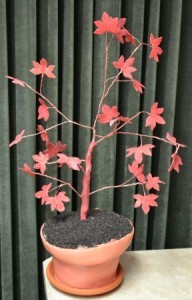 A red leaf Japanese maple can take on a green cast or multi colored cast when it is not getting enough sun. There are several types that have that multi coloring on purpose. Take a leaf to a local nursery and they should be able to identify the type you have. I would bring pictures to show the bark and structure too. Truth be told, nobody can really identify a Japanese maple or any other plant by sight. There are over 1,100 different Japanese maples. Are the cuttings that you have to stick “Rant Compliant”. Honestly, this is the most important thing I can teach new members. Check your soil pH. Often times if the soil is to alkaline (7 or over) you may have an iron deficiency which causes the tree to go more green, also potentially to much nitrogen in soil.